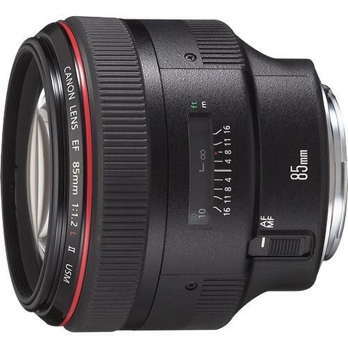 The Canon 85mm f/1.2 II is an L-series, fixed focal length lens with a high-performance, very large maximum f/1.2 aperture and USM ultrasonic focus. It is will suited to portrait and still-life photography where the f/1.2 aperture gives extraordinary control of depth of field. The f/1.2 aperture also provides exceptional low light performance. USM: Canon USM ultrasonic autofocus is faster and quieter than mechanical autofocus systems.